The Hezbollah-bound arms shipment that was seized by Israel Navy commandos Tuesday night left an Iranian port 10 days ago aboard a local merchant ship. The weapons and ammunition, including 106 mm shells, 107 mm and 122 mm rockets, hand grenades, mortar shells, anti-tank missiles and ammunition for AK-47 rifles, were hidden in polyethylene bags. 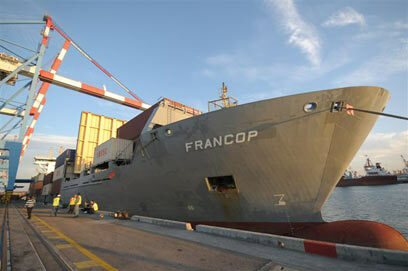 Following a 2,500 mile journey, the FRANCOP vessel docked at Egypt's Damietta Port after crossing the Suez Canal. As part of the plan to deceive Israeli intelligence services, the 36 containers containing the munitions were then transferred to a German cargo ship sailing under an Antiguan flag. The ship is owned by Cypriot charter company UFS, and its captain is Polish. The vessel left the Egyptian port at around noon Tuesday. It was scheduled to dock briefly in Cyprus before heading to the Syria's Latakia Port. IDF officials estimate that Syria planned to transfer the weapons to Hezbollah operatives in Lebanon by land. The ship was seized by Israeli Navy forces a few hours after it left Egypt. Syria responded to ship's seizure for the first time Wednesday afternoon, with Foreign Minister Walid Moallem saying, "There are professional pirates at sea who are hurting trade between Syria and Iran." He did not specifically mention Israel. Speaking in Tehran during a joint press conference with his Iranian counterpart Manouchehr Mottaki, Moallem added: "The ship was carrying goods to Syria, not Iranian arms. There was no equipment aboard the ship meant for the manufacturing of weapons in Syria." UFS, the Cypriot company that owns the ship, said it was not aware any of the containers contained weapons. See all talkbacks "Arms ship: How Iran tried to dupe Israeli intelligence "